Well here we are again. October means it’s farewell to the abundance of the summer garden. The borlotti beans have all been collected and frozen, ready for autumn and winter recipes, the runner beans are coming to the end and the courgette plants are looking very forlorn. I’ve had a good crop of courgettes this year and have sautéed and frozen several bags ready for use and there’s no doubt that if we have a few mild days they’ll keep producing small fruits which can be added to the day’s dinner dish. 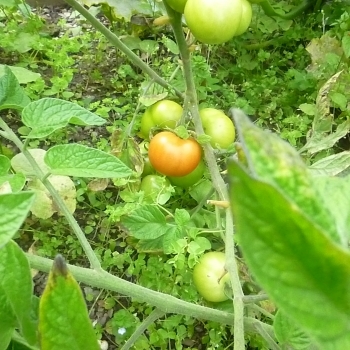 This year I only grew tomatoes outside from some seeds left over from last year. 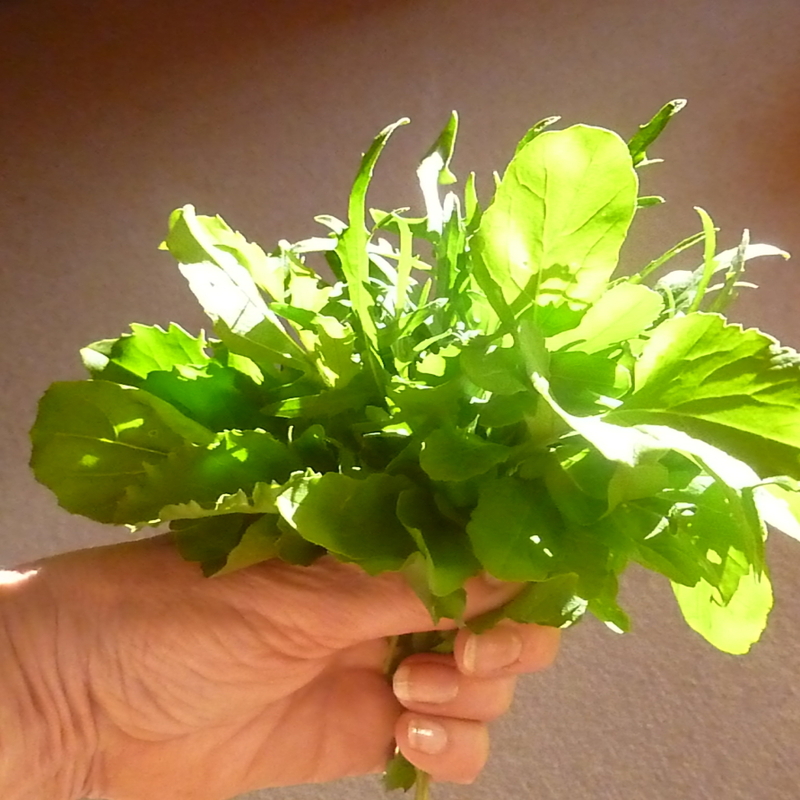 These were a potato leaf variety called Tamina. 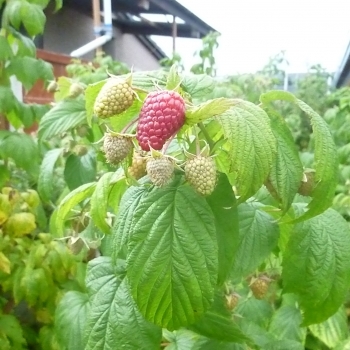 The fruits vary from quite large to reasonably small and despite the unpredictable summer weather the crop wasn’t bad. 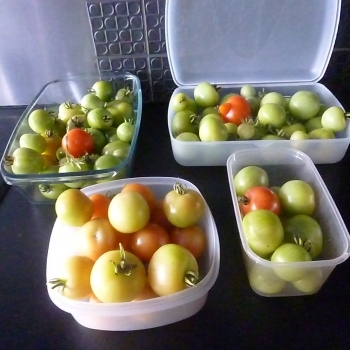 I picked and used some as they ripened in salads and in various curries, chillis and sauces but cooked some off and stored in bags in the freezer for use later in the year. Today I gathered in th e last few semi-ripe and green fruits before the weather deteriorates and ruins them. I’ll try and ripen some of them off in the kitchen, popping a ripe fruit or a ripe banana in with the green ones encourages ripening (the scientific reason being that the ripe fruits give off ethylene which stimulates the green fruits to ripen too-it’s a natural process but I’m just giving nature a helping hand). The unripe and remaining semi-ripe fruits will be cooked down and frozen or if I find the time and have the rest of the required ingredients I might make a chutney. As well as tomatoes I’ve collected a few more raspberries, it wasn’t such a good year for them but I’ve frozen some, eaten a lot with cream (a simple but perfect dessert) and with any luck I’ll have enough to make raspberry gin. The beauty of making fruit gin is that it is really straightforward, traditionally sloes are used but you can use raspberries, blackberries, damsons or any of the raspberry hybrids such as Tayberries, Loganberries or Boysenberries. I daresay blueberries would make an amazing gin liqueur but I haven’t tried that yet. 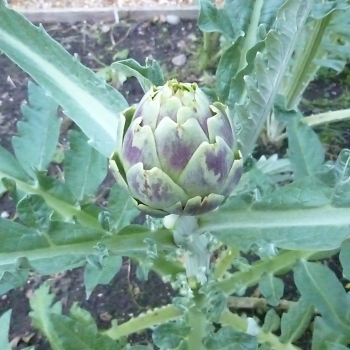 A new and quite fun addition to the vegetable garden this year is globe artichokes. Having never tried growing them before I’m quite please with the results. Although there’s only a couple of buds so far there are more in the wings and I’m looking forward to cooking them from fresh. I’ll share the results when it happens. to supplement the shop bought vegetables. a few seeds in a pot in the spring/summer and bringing the pot indoors in the winter. 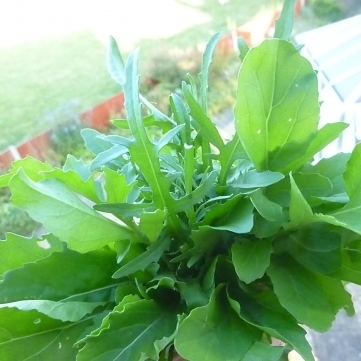 A handful of rocket has been my saviour in the kitchen on many occasions. Go on try it. You won’t look back.